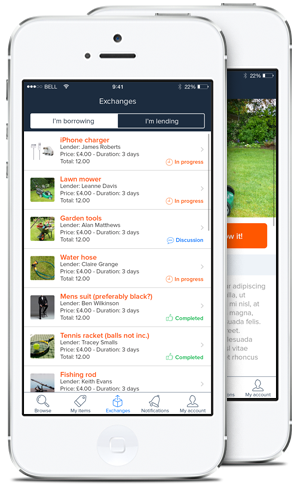 Borrow–it is a new app that puts borrowers and lenders in touch. Need a lawnmower but don't want to buy one? Search for it on the app and borrow it. Want to try out a particular kind of tent but don't want to fork out until you've tried it? Search for it and try before you buy. Want to earn a bit of extra cash? Think about what things you own and would be willing to lend out for a fee. Post them on the app. Spent a load of money on something that you love but couldn't really afford? Earn the money back by lending it out. We've all bought things we only use once or occasionally and then grumbled about paying for something that then gathers dust for years. Borrowing things means you don't have to fork out much money, you don't have to store them and/or you can try stuff before you buy it. Bought something you couldn't really afford? Besides recouping some of the money you spent, lending means you get to meet people in your geographical, work, school or hobby community. You will pay £1 to the company ‘borrow-it' for every item you borrow. The cost of the item you borrow depends on what the lender decides they want for it. All payments are handled via Paypal and their commission fees are payable in addition. What if the borrower doesn't return my item? You should initially make contact with the borrower via phone and in app messages. If you have any issues after that then please contact us for further advice. What if my item is damaged during the loan period? If you haven't purchased insurance this is something which you will need to resolve with the borrower direct. If you are worried about your item being well looked after, then you can request a returnable security deposit from the borrower. We advise that you agree any security deposits along with the agreement about the item's return date, before the exchange is confirmed. I'd like to lend out a high cost item. Can I get it insured? There are companies offering insurance for lending and a popup message within the app offers to connect users to one of these companies where a policy for the duration of the lend can be bought online. Insurance is availble from £1 a day and covers accidental damage, theft and public liability. Terms and conditions apply. The thing I want to borrow isn't listed. What do I do? If you want something that you can't find listed, you can put out a message via Request It from the search box. Lenders will receive push notifications and if they have the item you are looking for, might list it and you will be notified that it's now available. Can I borrow things if I'm away from home? Yes. The app makes use of location settings so that borrowers can benefit while travelling. Any item that you own! From a phone charger to a wedding dress to a lawn-mower. Be inspired with some ideas of things to borrow and lend which you see on the home page. But remember, these ideas are just a start – you can really lend almost anything you want to. Is there anything I can't borrow/lend? You cannot borrow or lend weapons or any illegal goods. We will remove anything listed that falls into these categories. The app is available for use worldwide. The only stipulation is that you have to be over the age of 16 to register as a borrow-it user. Can I get the app on any phone? The borrow-it app is currently only available for iPhones. If there is demand then an Android version will be developed.